As indicated in an earlier post (September 14), using a calendar year as a metaphor for the 4500 million years of Earth history and employing January 1, New Year’s Day, as the Earth’s birthday, I calculate the current date’s location in the Earth Year and detail what was happening paleontologically at that moment in Earth history. Today, is day 284 out of 365 days in this (non-leap) year. Not even an entire month has elapsed since my last post on this subject, yet in geologic time, October 11 represents 999 million years ago. Though we are still in the Proterozoic eon, at this point in earth history single-celled organisms have begun to live together in colonies. Protozoans living in colonies would have occupied more space than protozoans living alone and might have been less vulnerable to challenges of daily living in the late middle Proterozoic. Furthermore, colonial living would have enabled some cells to specialize in certain tasks such as reproduction or locomotion. As a result, colonial protozoans might have had a metaphorical ‘leg-up’ in the late middle Proterozoic over their relatives who lived alone! 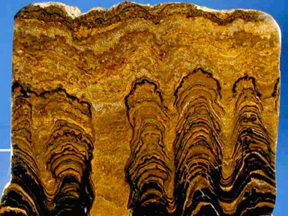 Evidence of these ancient colonial protozoans occur as fossilized stromatolites (pictured above). Found in numerous places on earth today, stromatolites are the main sedimentary features of carbonate rocks from earliest Earth history. They are the products of sediment trapping by mat-building microorganisms, known most widely as cyanobacteria. Living stromatolites also occur today but are quite rare because they are subject to predation. As Stephen Jay Gould wrote in Time’s Arrow, Time’s Cycle: Myth and Metaphor in the Discovery of Geological Time (Harvard, 1987), “If moments have no distinction, then they have no interest” (80). Gould proposed this aphorism as a description of the troubled situation that pure visions of time’s cycle impose upon history. This passage holds significance for me as the world anticipates the upcoming United Nations climate change conference to be held in Copenhagen this December. Recently in Barbados’ daily newspaper, The Nation, a special two-page section drew readers’ attention to the country’s celebration of World Maritime Day (sponsored by the International Maritime Organization of which Barbados has been a member since 1970). The newspaper reported that the purpose of the day is to focus attention on the importance of the shipping industry, safety, and security, and the marine environment (24 September 2009, 20). The designated theme for World Maritime Day 2009 is climate change. As an island nation with a heavily developed seashore and nearshore populated by locals as well as visitors, Barbados will face substantial challenges as sea level rises dramatically. Coral bleaching and depletion of seafood here also been linked to climate change. Furthermore, as a water scarce country, climate change also threatens drinking water supply of Bajans and their visitors. So I’m struck by the overlap of the upcoming UN Conference, the focus of World Maritime Day and the precarious future portended by unattended climate change. It has me thinking about the cycles and arrows of time. Gould wrote about the model of a large disk rolling along a railroad track as a metaphor for intertwined arrows and cycles of time (81). Gould points out that cycles advancing as they turn allow for history. As his proposed aphorism states, moments without distinction have no interest. Without a way to distinguish between a particular stage in the cycle, we are unanchored in time. Everything comes round again, as Gould says (80). For time to be truly meaningful, it must be more than cyclic repetition. But “cyclic repetition with a difference” as Gould refers to it combines time’s cycle with time’s arrow. Among the speechifying that may occur at Copenhagen, I would anticipate declarations of “now is the time,” exhortations to take action to curb greenhouse gas emissions immediately. It’s likely that speakers will extol the virtue of quick action because of our previous inattentiveness to increased greenhouse gas emissions and consequent global warming. Clearly time plays a significant part in this global conversation. The idea that there is urgency to the climate change talks, means the subject is climate change through time, not simply climate change in space. My mind runs to the 1997 Kyoto Conference on Climate Change. How did the verbiage of that meeting go? Will verbiage at the Copenhagen conference sound the same as Kyoto? If so we will have nothing more than cyclic repetition or in Gould’s words, time’s cycle without time’s arrow. Are we trapped in the view of climate change constrained by a dominant view of the Earth system as a system of endlessly renewing cycles? Carbon cycle, hydrologic cycle, nitrogen cycle, rock cycle, plate tectonic cycle. Reduce, Reuse, Recycle? With such an emphasis on reusing and recycling, maybe we may have lost sight of time’s arrow– the role that distinctive events play in making history. Many factors indicate that we are not at the same place in the decision cycle pre-Copenhagen as we were pre-Kyoto. Global temperature is warmer, weather more disrupted, sea level higher. We should behave at Copenhagen in a way consistent with this reality. With such a consciousness, we can act on the arrow as well as the cycles of time as they relate to climate change.